I built this tool to help me wrap my head around what I needed to do to produce all the food needed to provide for an adjustable number of people / selling food. Fortunately, my dogs love Zuchinni of which I had 10 plants. 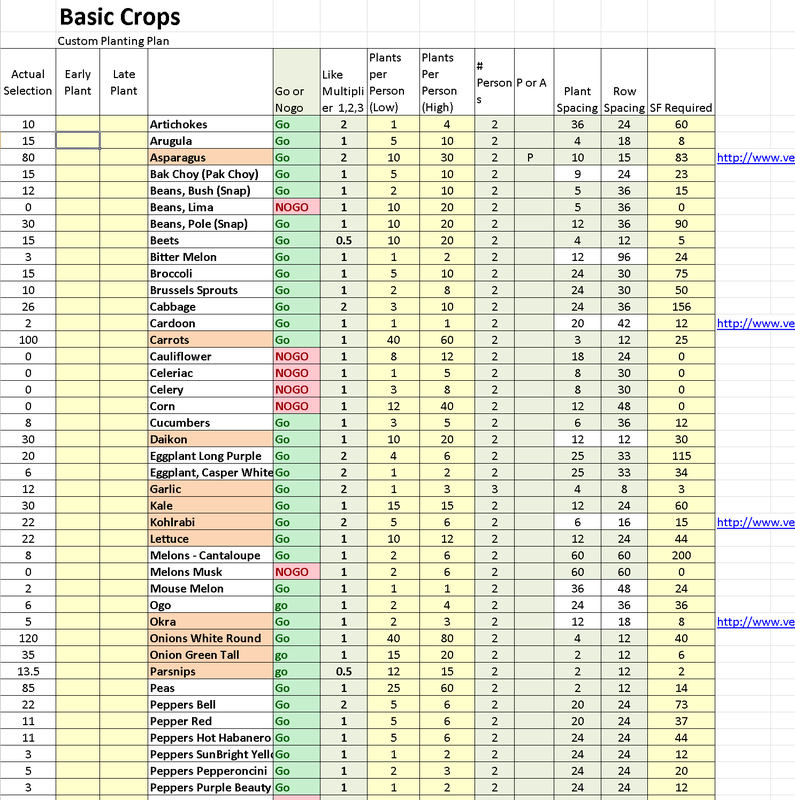 This spreadsheet provide information on number of plants needed, customizable for number of people, and a "like" factor based on whether you want more of a vegetable or less. And it calculates the total square footage needed, including room for walkways and tools and such. Enjoy, I will maybe improve this spreadsheet in spring. Bottom line...it worked, besides buying occasional protein (chicken, milk, beer) this garden did achieve the goal of producing all our food. This is great, stock. How do I get the "Basic Crops" diagram to go larger? When I click on it, it goes to another Window but it's still hard to read. And I want to read it and print it out because that's a great resource diagram you created! I'm actually on vaycay as I write this, but I wanted to be sure to tell you that your intelligence and good-character come through in your blog and posts, and I am grateful for all of your hard work. Doh! I figured out how to make it larger. Thank you again. It's great. Title: "Small Space Permaculture Food Forest Garden on 1/4 Acre Home Lot"
Thanks to stock for coinkydinky linky! Playlist: "How to create a food forest"
I miss my days on the commercial vegetable farm. Food for thought. sigh.